Fort Saint Clair (1791-1796) - Established during the Northwest Territory Indian War as a supply depot in 1791 by General James Wilkinson. Named after General Arthur St. Clair. Abandoned in 1796. Built in 1791 during the Northwest Territory Indian War (1785–1795) as a 120' square palisaded fort with four sided, arrow shaped, bastions at each of the four corners. On 6 Nov 1792, the fort and troops outside the fort were attacked by a force of 200 Miami Indians under chief Little Turtle. The Kentucky Militia under Maj. John Adair drove off the attackers with a loss of only six Kentuckians. 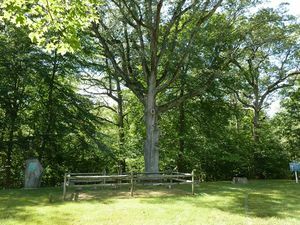 Those six fallen militiamen were buried on the site under what was known as the "Whispering Oak" tree. That oak and the grave markers of the six are in place today. The fort was abandoned in 1796 after the end of the Northwest Territory Indian War and the subsequent Treaty of Greenville. 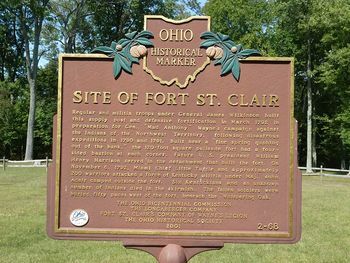 Part of Fort Saint Clair State park near Eaton, Ohio. The fort site is outlined with a fence and a state marker sits in the center of the outline. The "Wispering Oak" and the grave markers of the six fallen soldiers sits off to one side of the site. Various markers and display signs help interpret the site. 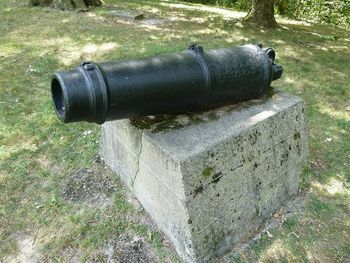 One period cannon on the site. Location: Near Eaton, Preble County, Ohio. This page was last modified 08:36, 26 March 2019 by John Stanton.